Public Security Minister visits fighters wounded in Jenin last night during capture of terrorists who murdered Rabbi Shevach. 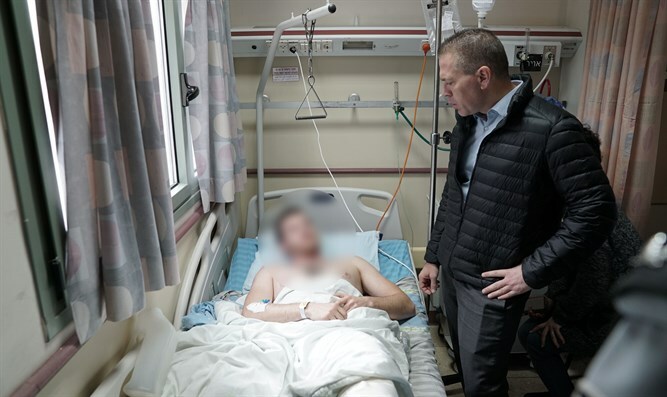 Public Security Minister Gilad Erdan arrived at the hospital Thursday morning to visit the fighters wounded during the capture of the terror cell that murdered Rabbi Raziel Shevach. “We have come to salute, in the name of the entire Jewish people, the Yamam fighters, who carry out their work in the best way compared to anywhere in the world. I met fighters here who are determined and proud of what they did,” Erdan said. At the same time, the PA’s so-called “Health Ministry” denied initial reports that the terrorist killed during last night’s operation in Jenin was Ahmed Nasser Jarrar, 22, the son of Nasser Jarrar, a Hamas official killed in 2002 during Operation Defensive Shield at a time when he was planning a massive terror attack. The official PA announcement says that the terrorist killed last night was a man with a similar name. Rabbi Raziel Shevach was murdered in a shooting attack last Tuesday near Havat Gilad in Samaria. The terrorists fired at Rabbi Shevach's vehicle at close range and then fled the scene. Rabbi Shevach was able to record a message on WhatsApp, in which he said "I was shot, I was shot!” and send it to his friends at the Magen David Adom organization, where he served as a volunteer paramedic. Rescue forces arrived at the scene and evacuated Rabbi Shevach to the Meir Hospital in Kfar Saba, where he died of his wounds. Since the attack, the IDF and the Shin Bet had been conducting a manhunt for the terrorists, and blocked the city of Shechem (Nablus) and other nearby villages. Rabbi Shevach, 35, left a wife, Yael, and six children.